Often the best way of downsizing is not getting your own tiny house or apartment, but sharing a larger house or apartment. But finding a nice place to share, nice people to share with and enduring the myriad issues that house-sharing brings, often drives people to pay more than they want in order to live alone. Enter Stage 3 Properties, a real estate startup that seeks to alleviate the woe that often plagues the shared-housing experience. I spoke to Chris and Andrew Bledsoe, the brothers behind the Stage 3. They explained to me how firsthand experience–verified by focus groups, surveys and other research–showed a gulf between how people live and what the market is offering. They found that young people, particularly young professionals, are living very differently than they did 20 or 30 years ago. In fact, the name Stage 3 is taken from the third stage of life, which they define as “emerging adulthood”–the period right after college and before adulthood/parenthood. These third stagers are choosing to stay single longer. They are more mobile. They are choosing live experiences and cities over stuff and the burbs. But these same people are facing new challenges like a stagnant economy and a severe shortage of attractive, affordable housing options in most major metropolises. Even finding clean, basic housing–which is what many of them are looking for–can be out of reach. Christopher Bledsoe said, “Most landlords require an annual income of forty times monthly rent. Since the average rent for a studio is around $2500 in many parts of Manhattan, that works out to be $100K just to get your foot in the door.” This is a big number even for the relatively well-heeled first year analyst at Goldman Sachs, he says. Faced with this situation, most turn to what he calls the “underground housing” market. Stage 3 did a deep analysis of Craigslist rental listings in thirty of the top US metropolitan areas and they found a significant percentage of listings were for people posting in the “rooms/shared” category–i.e. people looking to rent out a room in their apartment or even sometimes share a room. But Bledsoe believes that most of these situations are far from ideal. 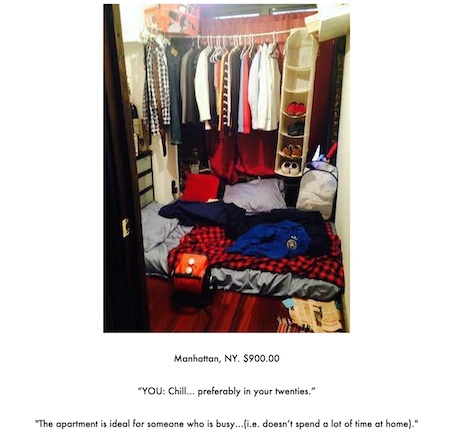 He points to the Tumblr blog “The Worst Room,” which showcases the dregs of Craigslist rental listings, as an example of what awaits many people looking for an apartment share (something I, a longtime New Yorker, can say is not so far off the mark). Then there are other inherent problems with roommate situations: Many apartments are not designed with the 20-something shared renter in mind, often resulting dining rooms and living rooms that double as makeshift bedrooms. Meanwhile, finding roommates you like is a crapshoot at best; you are often financially tethered to virtual strangers through a lease; most people have different ideas about what constitutes “clean”; and so forth. 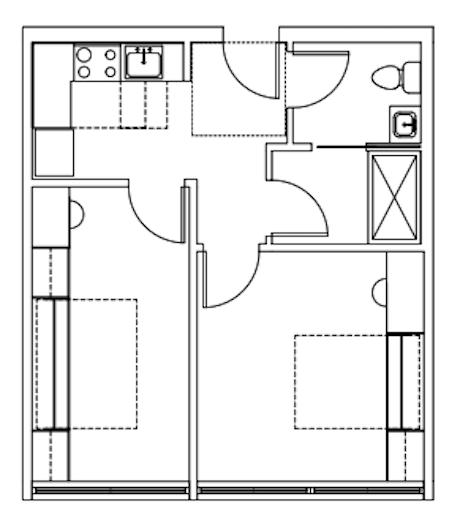 Purpose-built micro-suites, designed specifically for sharing, with large bedrooms and smaller common spaces (sample two-bedroom floorplan below). Furnished rooms that include space efficient furniture. They are planning on using beds from Resource Furniture. An online roommate matchmaking service, akin to an internet dating site. Lease insurance, which protects you should one of your roommates bail from his/her lease. Full-amenities like house cleaning and laundry will be included in rent. Some of their buildings will feature hotel-style pools and gyms. And, Bledsoe’s personal favorite, social programming designed to foster networking opportunities and a sense of community among neighbors. Think weekend white water rafting trips upstate during the summer months and ski trips in the winter months. Bledsoe says Ollie will cost 30% less than renting a studio in the same neighborhood. In other words, if a studio were to cost $2500 in a newly renovated, full-service building, then Ollie would target per-tenant rents of about $1700, inclusive of furniture, housekeeping and other amenities. This might strike some (non-New Yorkers) as a large number, but Bledsoe points out that this is not too different than the price of renting a spare bedroom on Craigslist within a shared apartment, possibly even within a walk-up building without any of the added accoutrements that Ollie promises to deliver. Moreover, he believes the social component of living in an Ollie apartment will prove to be among its biggest selling points, providing benefits that cannot be obtained by living alone in a studio. Stage 3 does not want to limit Ollie to the most exclusive neighborhoods in Manhattan. Through a partnership with New York-based Simon Baron Development Group, they are aiming to offer 10K units in the next few years throughout New York as well as other east coast cities like Boston, Philly, Washington DC and Miami. They have three projects in the New York area in the works that will roll out in the next couple years, with the first units leasing in 2015. As we noted the yesterday, many individuated micro-apartment developments are stalling because of regulations. Moreover, even when studio-style micro-apartments do hit the market, their rents will still be out of reach for many, leaving a huge need for clean, basic housing. The Bledsoes have received pre-consideration approvals from New York City’s Department of Buildings, which they say validates that Ollie is a solution that will work without any housing reform, improves upon the common practice of apartment sharing, and stands to represent a significant addition of clean, practical housing in today’s cities. This is a great idea. Wish something like this was around when I was younger, or I would have totally gone this route. when will Stage 3 start hitting other cities too? I’m ready to sign up for Denver! Hi Steve, we have Denver on our radar but no site picked out yet there. We are looking for opportunities to either develop or lease a block of floors which we can convert into Ollie branded microsuites. Thank you for the support! Where’s your NYC building opening up in 2015? I’d like to look at leasing a room/apt. My lease is up in Oct but I can move earlier. We have single room micro-studios available for lease starting now on the Upper West Side of Manhattan. 166 W 75th St. Here is a link to the website: http://www.amstrdmnyc.com Please note that because these are not shared micro-suites the price per bed is higher than if you were sharing an apartment in our two or three bedrooms. Ollie really is a best-practice when it comes to co-living spaces! Thank you for this interesting article!